Daniel Piatek ’17 enrolled at Seton Hall thinking he might want to become a doctor. But that career path took a turn when Piatek began working in the Laboratory of Electrophysics & Atmospheric Plasmas, led by physics professor Jose Lopez, who has conducted extensive research in plasma physics. Lopez and other Seton Hall professors had begun a seminal experiment designed to gauge whether cold plasmas — the fourth state of matter — could stimulate the growth of plants. Piatek was hooked. Piatek envisioned a similar research project of his own, so he applied to a Seton Hall committee and received a summer undergraduate fellowship with funds provided by the New Jersey Space Grant Consortium, which was established by a grant from NASA. This type of work could have global implications. The potential for cold plasmas to accelerate plant growth could mean more-productive harvests around the world, providing food for the planet’s ever-expanding population. 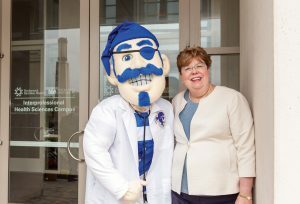 Piatek came to Seton Hall under a dual-degree program in which students spend three years at Seton Hall and two years at the New Jersey Institute of Technology. 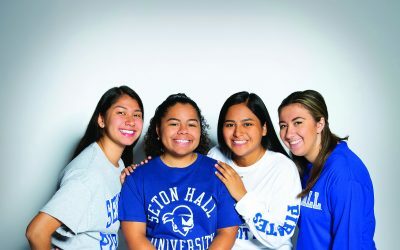 Upon completion, they earn two bachelor’s degrees — one in physics from Seton Hall and one in biomedical engineering from NJIT. But after spending one year at NJIT, Piatek knew he wanted to pursue a career in physics. When Seton Hall announced it was creating a two-year master’s program in physics, starting this fall, Piatek applied, and in May he became the program’s first official enrollee. Piatek had begun his interdisciplinary kidney bean research project by coordinating the construction of an elaborate scaffolding system inside a greenhouse on the roof of McNulty Hall. The scaffolding held the hydroponically grown plants and was encased in thick plastic blackout curtains, because Piatek wanted to control the amount of light the plants received and restrict them to eight hours of artificial light each day. Three hydroponic systems were created. One was not treated by the cold plasmas, another applied cold plasmas only to the leaves of each plant, and the third applied the cold plasmas to the roots. The study measured the effects of atmospheric pressure cold plasma jets over different treatment durations and different frequencies of application. The cold plasmas, which behave like a gas but conduct electricity like a wire, were applied with the use of a hand-held device that looks something like a can of spray paint and emits a small flame. In addition to Lopez, one of the world’s leading experts in the subfield of microplasmas, Piatek was assisted in his research by chemistry doctoral candidate Daniel Guerrero. Complementary work on basil plants was conducted by chemistry master’s degree student Sauvelson Auguste, along with chemistry professors Cosimo Antonacci and Father Gerald Buonopane. 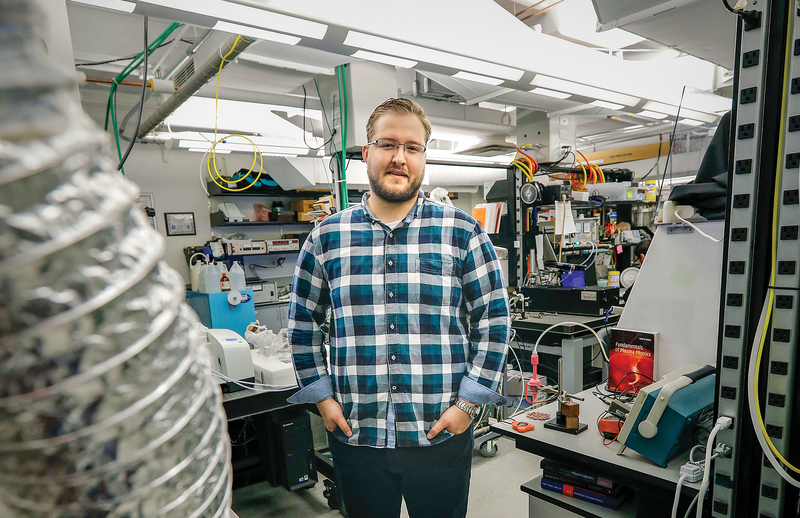 This summer, as Piatek prepared to enter the master’s program in physics, he had the singular experience of working in the Princeton Plasma Physics Laboratory. The Department of Energy national lab is one of the world’s foremost plasma research institutes, and Piatek worked on plasma propulsion technology known as a Hall Thruster, which could be used for maneuvering satellites or propulsion systems for future spacecraft. Christopher Hann is a freelance writer and editor in New Jersey. This story was revised to clarify information about the grant that Daniel Piatek ’17 received. An earlier version indicated that Piatek applied for and received an undergraduate fellowship from NASA. Piatek applied to a Seton Hall committee that awarded the fellowship, with funds provided by the New Jersey Space Grant Consortium, an organization founded by a grant from NASA.